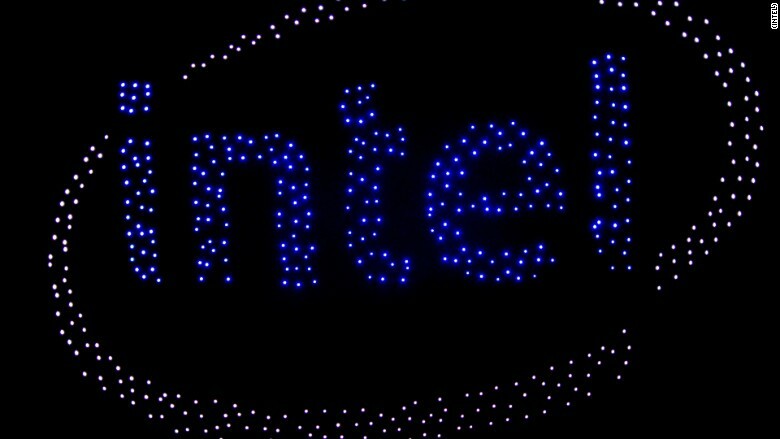 Intel's drone are delivering increasingly impressive light shows, but that may be only the beginning. The tech company unveiled its new "shooting star" drone Friday as it released a video of 500 of the drones flying in formation in Germany this fall. 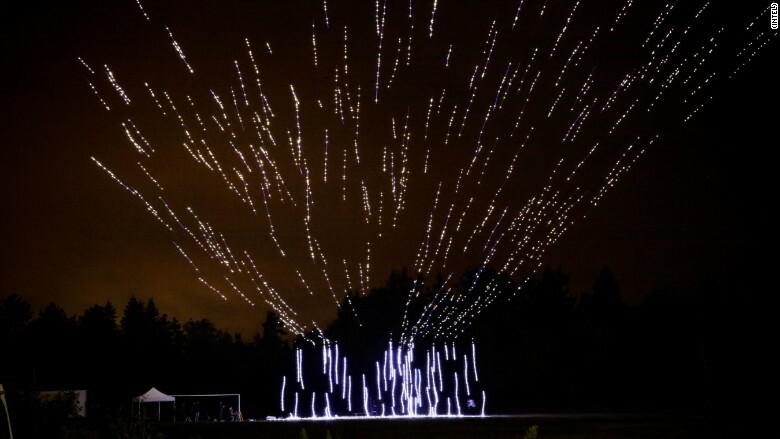 The autonomous drones, which are essentially an LED light with propellers attached, darted around the sky, spelling out "500" and "Intel." The drone shows could rival fireworks displays. But Intel sees a lot more potential than wowing crowds on the 4th of July. Anil Nanduri, Intel's vice president of its New Technology Group, noted to CNNMoney that companies spend heavily to promote new products. "Think of a display in the sky," Nanduri said. "What would you do with it?" 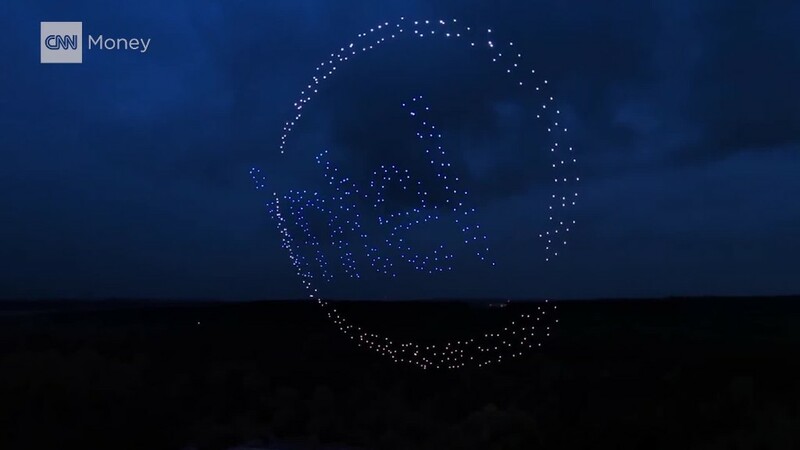 By spelling out "Intel" with its 500 drones, the company has shown that advertising a corporate logo is doable. And as more drones are added to its light shows, it will be capable of even more complicated designs. 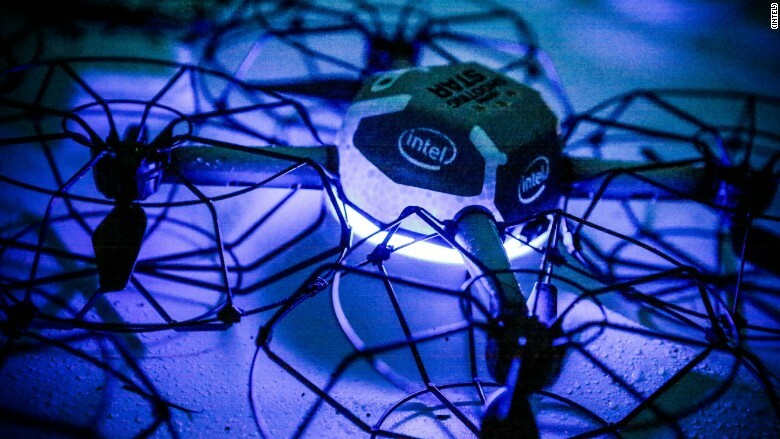 Intel reached the 500 drone barrier less than a year after flying 100 drones simultaneously. Intel (INTC) CEO Brian Krzanich has previously talked of flying 1,000 drones at once. Since Intel's drones fly autonomously, only a handful of people are needed to operate a huge light show. When Intel demonstrated the 500 drones in Germany, three or four people were monitoring the drones. Nanduri sees the lights as a favorable alternative to fireworks due to pollution and noise concerns. The flying drones also allow for synchronizing with music. Intel's drones weigh just over half a pound, and their batteries last for 20 minutes. Intel isn't the only one wanting to use drones for lights shows or creative advertising. Last week, Disney received a waiver from the federal government to fly drones at its theme parks. Disney wants to use "Flixels," autonomous drones with LED lights, to accompany entertainment, including fireworks shows. And Uber has used drones in Mexico City to hover in front of cars stopped in traffic and advertise its services. Nanduri said he's eager to bring the technology to the United States, but said more testing was needed first. Intel has already received an FAA waiver to fly its autonomous drone flights at night in the United States. Nanduri, who has two young children, said the drone project finally convinced his kids their dad has a cool job. "When they saw the light show," Nanduri recalled, "They said, 'Wow your team did that?'"